Forensic Genealogy and Adoption – Betty Jean’s Story on Friday 7 June 2019 at 11:30am in Arena 2. 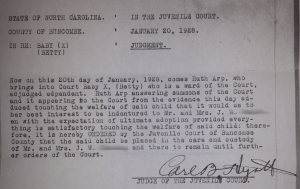 Betty Jean’s story makes for some truly, fascinating reading, with each breakthrough and discovery bringing the truth about her birth family one step closer. I had been told she might be in possession of some family papers or information. She sent my dad information a few years ago that she has compiled on all of my cousins and a bit on our family back a generation or two. She also has information on our McElmoyle’s (one tiny piece of paper on this line would be an avalanche compared to what I have already found). As soon as I told her why I was calling she said, “You know I am adopted” and I answered “yes I did”. St. Joseph’s Hospital was the only Catholic Hospital in Asheville, NC in 1927. Run by the Sisters of Mercy. “St. Joseph’s Sanitarium stands out because it was a religiously affiliated facility, operated by a small group of Catholic sisters, in an area where Catholicism was not the predominant religion. St. Joseph’s Sanitarium continued to operate and grow, despite community opposition, until the late 1930s.” Treatment with a Habit: Asheville, Truberculosis and The Sisters of Mercy. The University of North Carolina at Asheville, A Senior Theses submitted to the department of History in Candidacy For The Degree of Bachelor Arts, by Carol Fronkowiak Jordan, Asheville, North Carolina, November 2004.